The US Marine Corps has a new four-legged friend this week - the 'Spot' robot by Boston Dynamics. 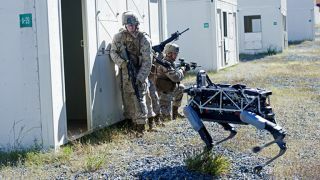 The 160-pound, hydraulically actuated quadruped, first revealed in February, is being put through its paces to see how it works with soldiers in different scenarios. Spot arrived at the Marine Corps Base in Quantico, Virginia, home to the Marine Corps Combat Development Command, with a team from the Defense Advanced Research Projects Agency (DARPA). In a series of drills that began on September 16, Spot could be seen accompanying soldiers in different conditions and across varying terrain. Designed for indoor and outdoor operation, Spot's versatility makes it a flexible military asset. Ben Swilling, a roboticist with DARPA who accompanied Spot for the tests, said "I think a robot like Spot has tons of opportunities we could use it for, like scouting or load carriage." For a closer look at Spot, check out this video from Boston Dynamics.